Oh boy, Sanderson! Helpful hubby didn't know any better :-) When they're matted they're a mess to deal with. If they're too much trouble to deal with, you could lay the "mats" around a tree you want to mulch and keep the weeds down. They work pretty well for that use. I gather lawn bags of leaves that are well dried and simply crush them in the bag. It doesn't take much effort and they get broken down into manageable pieces. I've never had a composting problem with them at that size. Pride goeth before the fall. It looks like Yardslave was right. I need to make a compost pile with these fine shredded leaves. Last night was freezing (frozen water) with lots of frost. This morning, when it was 45*F and the MM in the beds in the shade was 35*F, the core of the leaf piles was 130*F!! Like it or not, tomorrow I will have to brave the cold and make a winter Berkeley pile. Wet shredded leaves, horse manure and chredded alfalfa hay. Maybe a bag or 2 of Starbucks. I like to have produce or seaweed also but this will have to do for now. Note to Newbies: Hot composting is possible in the cold (maybe not North Dakota and other snowy areas). You don't have to wait until warm weather if you have the bulk. The microbes do the heating. S, you have got to change your avatar to the Energizer Bunny! It's too cold outside- I'll pass on composting for a while; right now, I'm just trying to keep the frost damage down on my citrus trees (have to tuck them in for the night). Talk about energy!! Covering your citrus trees during this cold snap sounds like a lot of work to me! Finally ready to build Compost pile #10. Well, as soon as I find more storage room for finished #9! You have 10 piles currently going?!?! No! This is the 10th one I have built since spring 2013! I only have room for a single 3' x 3' x 3'. I keep a log on each one so I can learn from mistakes. Plus, being Berkeley piles, I record the morning and night temperatures and when I turned, added water, etc. OH, good, I was feeling really inadequate! 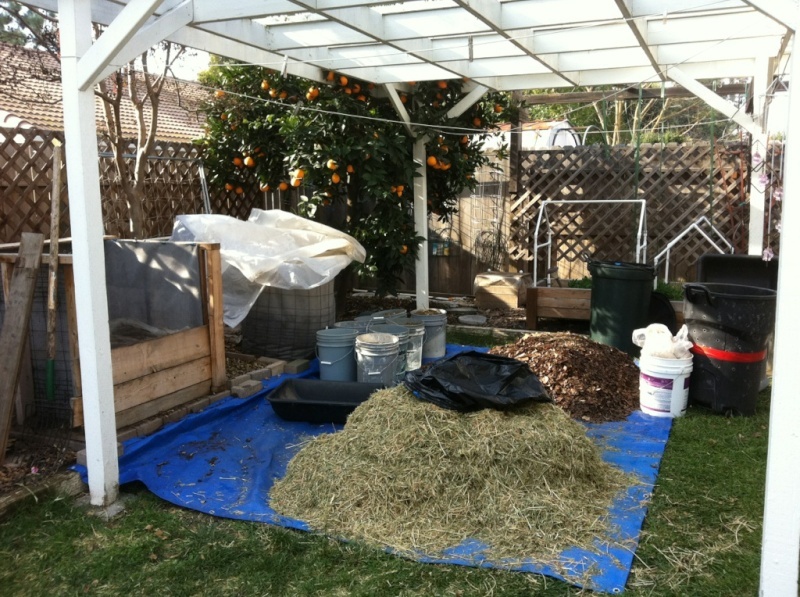 What is Berkeley composting? I can google but I'm being lazy and I know that would mean I get lost surfing and reading! when you gather your leaves do you ask if the owner has used chemicals. I gather my neighbors leaves as they fall in my yard and I asked her. I am saving to build a compost pile. I live in the desert in AZ so finding leaves is not easy! I am encouraged by the recent posts you have posted. And I need to watch my pride too as I tend to destruct! I also have a 'helpful' hubby. He helped me today make row covers. I was able to get close to what I wanted!! It should work! We work with what we have on hand! Thanks for all the helpful posts! Sanderson, I love your area! Do you have a shade on the ramada? Hi Cothe, Happy you jumped in. Besides, your climate is close to what Audrey, Grandma, Yardslave and I have. Hot summers, near freezing winters. The pergola (vs. ramada) has open slats for the roof, allowing reduced sunlight. No solid cover for it. We used to have a white wisteria that almost covered the top, but it died years ago. Now, a runaway cantaloupe will reach over the top. The material spread on the tarp was not quite enough to fill the 3x3x3' cage. Judging conical volumes for a cube can be hard. Husband is standing there say, "You'll never get this all in." Then he had to mow/chop up some more! I used the following 5-gallon quantities: 28 mowed wet leaves, 1 bale or 27 mowed alfalfa hay, 1 of Starbucks, 8.5 small crumbled horse manure and total of 3/4 cup of blood meal sprinkled on 3 layers. Gallon-wise, this totals over 27 cu ft, but as it is built and watered, everything compresses. When it's finished in 3-4 weeks, it will be down to 18-20" in height. 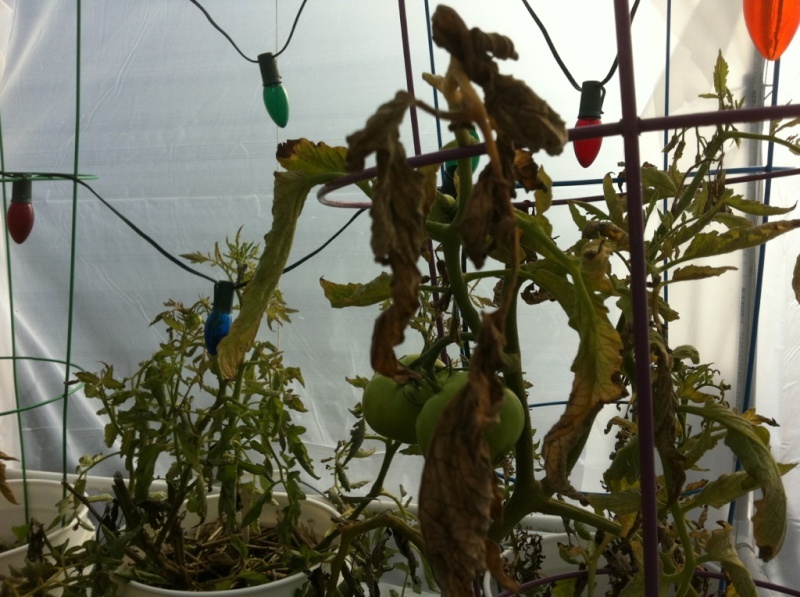 I generally get temps as high as 160-170*F for a few days, so most of the seeds and contaminates are killed. My neighbors have yard services, so the only things that would be spread on the lawns are fertilizer and maybe rye grass seeds for winter. I carefully, lightly rake up the leaves, being on the watch and sniff for doggy doo and twigs. I hope all of this helps. I saw an article in "Mother Earth News" about slow cooking in a hot compost bin: Corned beef and cabbage a' la compost pile. Can you imagine? 150 to 170 degrees is hot enough to get the job done. My wife would have a fit if any of her precious cookware were ever to touch my compost...that would generate heat far beyond any known method of cooking! This is a nice time of the year with a break from heavy gardening. Have a hot Berkeley compost pile going, and I can say, turning 160*F compost in the cold is a lot easier than in the dead of summer. Have four 33-gal wheeled garbage cans of ready compost for spring planting and filling the new hanging baskets. Today is shopping, starting the cookies for the exchange and evening service. Tomorrow, Christmas, will be finishing the cookies, turning the compost again, and maybe heading to Sac for celebrating Christmas on Saturday. So I will be around Christmas day if some folks aren't having big to dos and are on line. Nothing much going on outside right now. We're getting the bedrooms end of the house painted and re-carpeted. Been making bone broth, looking at seed catalogs for ordering. Turned the compost a few days ago for the 6th time. Base temp 60*F after turning and finally today it's up to a whopping 75*F. The MM in the bed next to the compost it 40*F so there is still some activity going on in the compost, however little. So here are some outdoor photos of current crops. The mislabeled "kale" broccoli is blooming. The main and side florets are delicious. 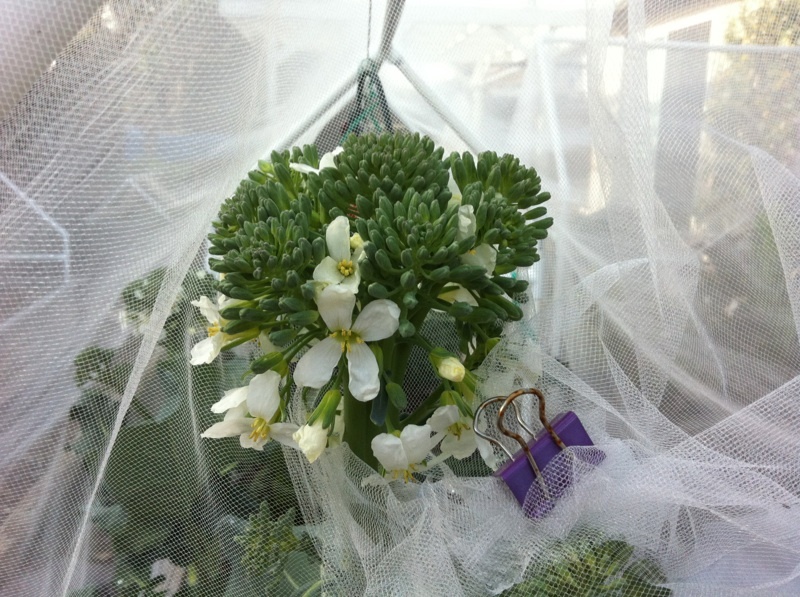 I brought this floret outside the tulle in case the errant bee comes by. October we went on a trip and I had to stick all the new seedling packs into the beds to keep them alive until I got back. 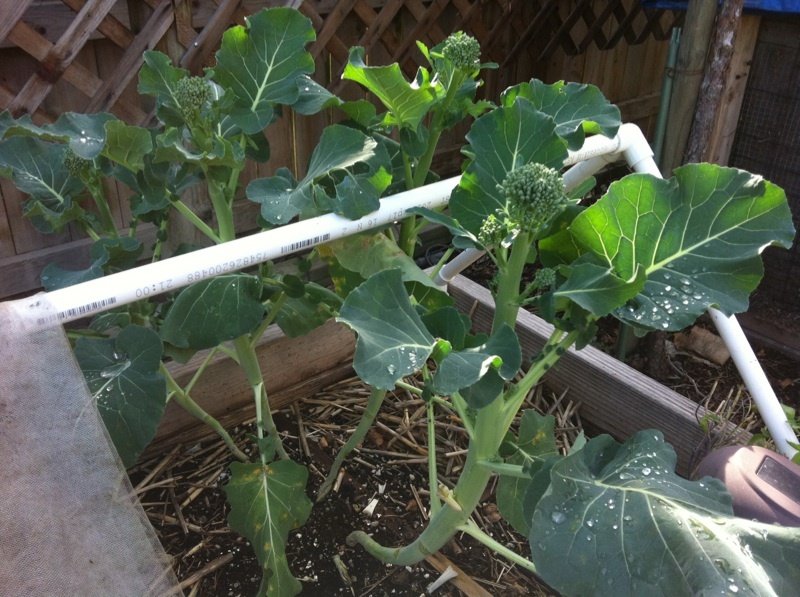 Here are 4 of the 6 broccoli planted in a 6" line that never got replanted. I just removed the 2 smallest. They are producing in the MM! 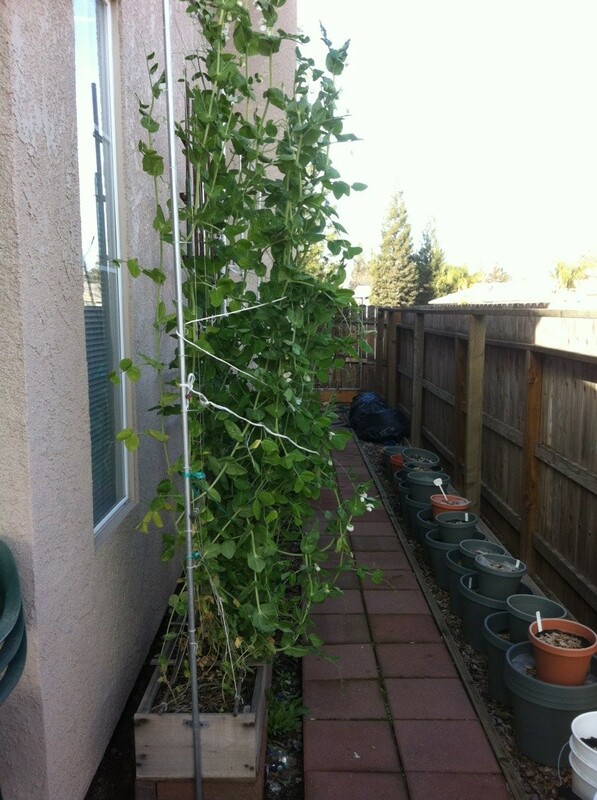 Snow peas with blooms, 7' tall. 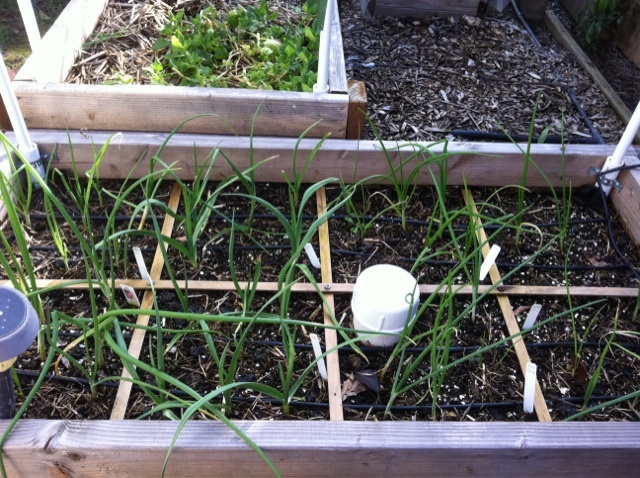 Garlic and onions growing in the summer cantaloupe bed. NZ spinach hanging in there in the background. Free range worm box with about 2" of new castings. 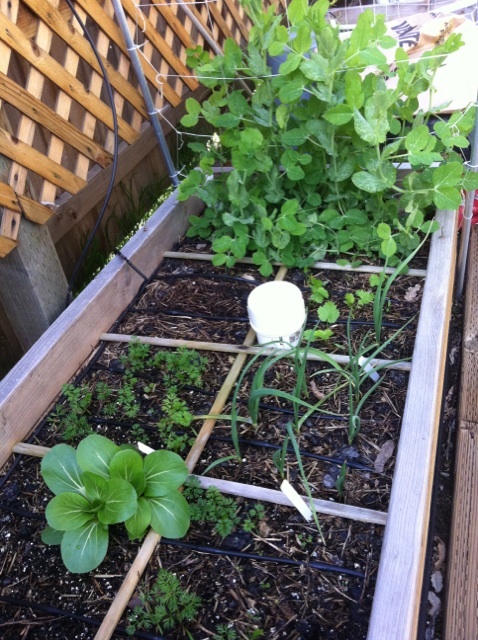 More garlic, carrot, parsnips and later-planted snow peas. 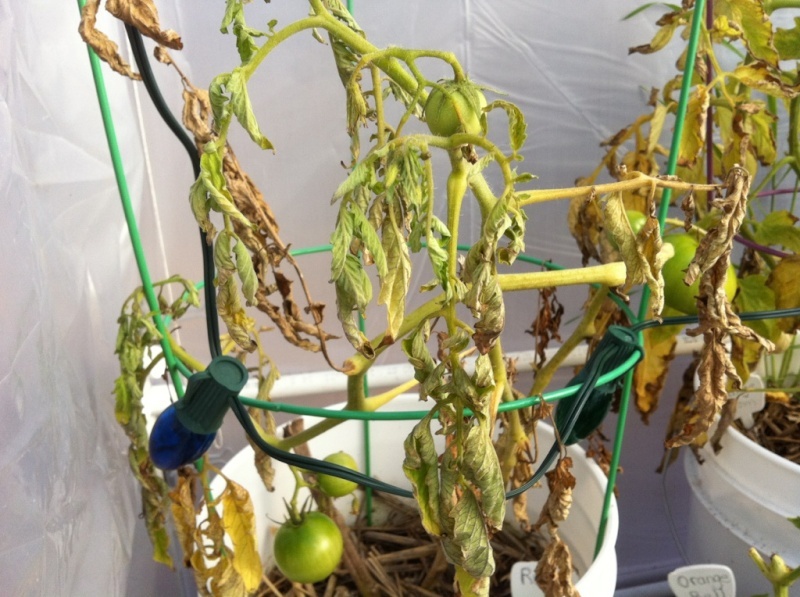 Green house tomatoes, 1-3" across. Sanderson ... that is just not fair!!! I've got about 2 feet of snow on my property and the temperature is well below freezing. I want to be growing things but it is nice to see what others are doing at this time of the year. What is that round leafed tufted plant in the 2nd to last picture towards the bottom? SR, 2 Taste of Asia bok choy?? 3rd from the bottom, just before the tomato pics. YS, House finches? Yikes. Reminds me of The Birds by Alfred Hitchcook.